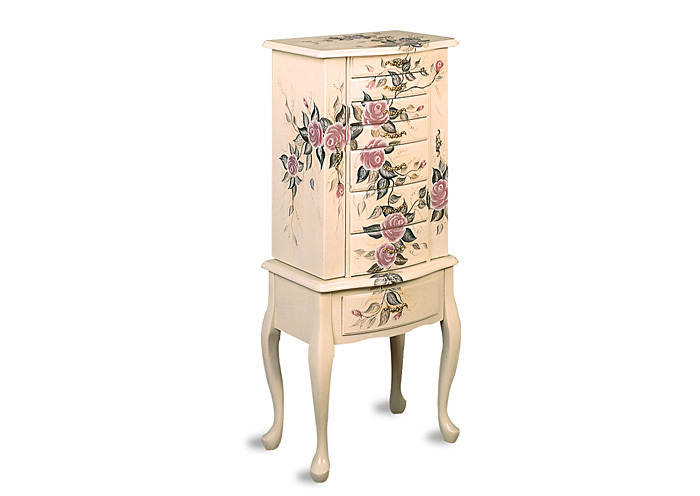 Part jewelry armoire, part work of art, this hand-painted armoire makes for a beautiful addition to a bedroom or vanity room. This wooden armoire painted in off-white with intricate floral designs cascading down the front features seven drawers, a flip-top mirror with additional top shelf storage, as well as two side doors to hang bracelets and necklaces. All drawers and doors are lined with soft felt to protect your items. The armoire's main shelving sits atop four legs to make the armoire a standalone piece.